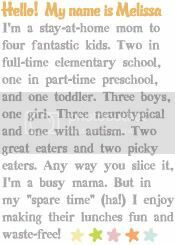 I've been posting all of Paige's lunches since the start of school, what with the excitement of Kindergarten Color Days and all, but I have fallen behind with posting Ethan's. This is a round up of what he's been eating. These boxes are from a Lock & Lock lunch set. - cheddar cheese, pretzels, and turkey on the left. - a fruit salad of kiwi and strawberries on the right, with a Snack Marker fork to eat it with. This was evidently the lunch Ethan had on Paige's Orange Day, which coincidently was pretty orange itself! 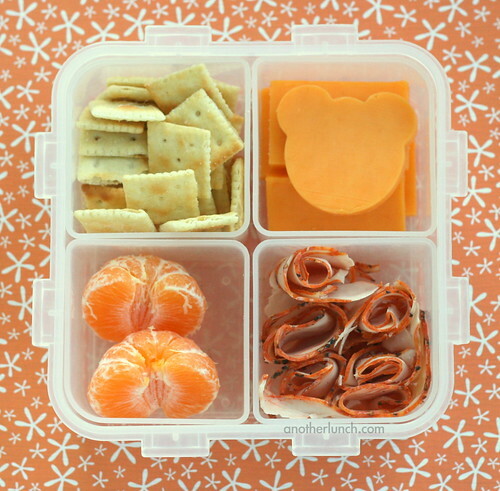 Mini saltine crackers, cheddar cheese, clementine oranges, and peppered turkey round out this lunch. On Amazon I found THIS. This appears to be the exact outer L&L box as the "4 square L&L" I have. The labels on my beloved 4 square boxes said they were 3.7 cup capacity, and that Amazon box has the same listing. However, it does not come with the inner boxes. Which was the greatest part. At BentoUSA they have THIS box. When the original L&L box I use disappeared it seemed at the time to be replaced with this box. It's very similar, with four inner sections. But the new style has two of the sections connected. So the four inner sections are made of two trays, each having two compartments. Hope that's clearer than mud. But the weird part to me is that the capacity there is listed as 1600ml, 1.6 liter, which is 6.76 cups -- almost twice the capacity of the original L&L box I always use. So I just don't know what's going on there. And that box is out of stock at the moment, so it's a moot point at this time anyway. 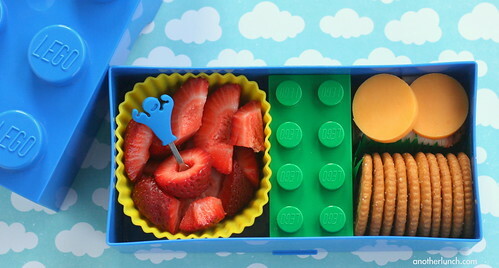 This lunch is packed in Ethan's Lego bento box. In the jumbo silicone cup are organic strawberries with a muscle man Snack Marker fork. The green Lego in the middle is a much smaller sized Lego snack box full of granola. On the right side is a row of crackers, turkey rolls and cheddar cheese, cut into circles. A piece of grassy bento baran separates the moist turkey from the crunchy crackers. 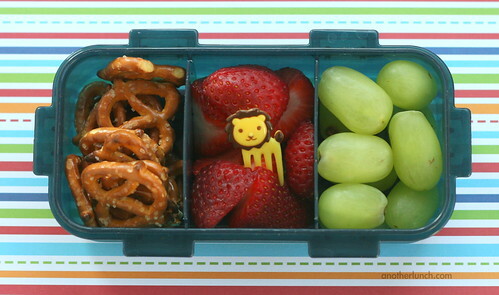 This is packed in the same Lock & Lock box as shown in the above L&L lunch set. This was Ethan's snack on a day he bought cafeteria food. 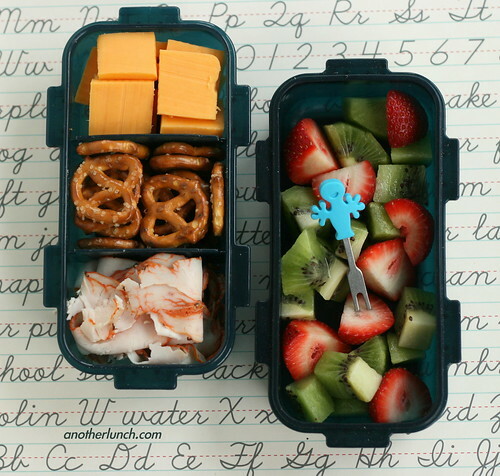 Pretzels, strawberries, and grapes. With a cute lion pick. Roar. I really like that lock n lock set. 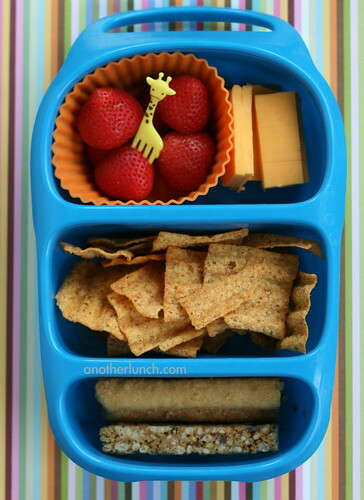 Your kids lunches always look fantastic. I found this product online, the website is in Canada..but maybe u can find the same container brands in the states.. Very cute! I think I need to buy some jumbo muffin cups. I love the new Byntos I bought, but I think you've said before how the jumbo cups fit perfectly in the top section. My cups seem to not be tall enough, so food is going everywhere. Also, have you ever used a Sigg Snack Box? 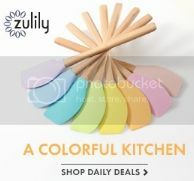 They have one on Zulily, but I've never seen anyone blog about it. I haven't seen a Sigg box! 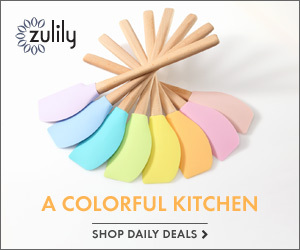 I saw the Sigg bottles on Zulily but I din't even click on it to see all there was... not I'm going to! They all look great!! And aaahhhhh I am so jealous of your lego boxes :D so cute! They were pretty cute for boys and girls! The 4 square lock & lock is still available direct from their website.